Friday, July 29 will mark the last day of service for uberHOP in Toronto. After running this pilot for nearly 7 months, we’ve learned a ton that will shape how we design and develop our carpooling option—uberPOOL. Since January, many Torontonians have been relying on uberPOOL for an affordable, door-to-door commute. By making it easy and affordable for commuters to carpool, we can get more people into fewer cars and help reduce congestion and pollution in Toronto. 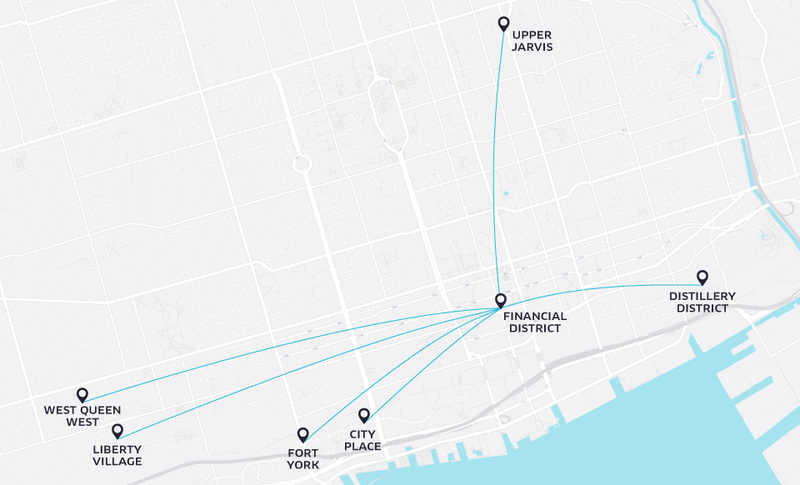 Meet uberHOP—a new option that lets you share your trip with other commuters along Toronto’s most popular routes during peak hours. uberHOP will be available along fixed routes for a flat fare ranging from $3.50 to $4.50. Uber launched in Toronto in February 2012, and since then, we’ve been excited about the idea of providing the most reliable and inexpensive transportation options. With uberHOP, we hope that Torontonians will rely more on ridesharing and less on their personal vehicles to help reduce traffic congestion in our city. uberHOP provides rides along these routes. Don’t see a route in your area? Give us your suggestion here. New ones will be popping up based on demand! Request: Tap the uberHOP option. Request the route closest to you. Remember that each person needs to request their own spot. Walk: Walk to the pickup spot. Be sure to arrive on time or you might miss your ride. Ride: You’ll depart from the pickup spot at the scheduled time on a direct route to the dropoff spot. You might share your trip with up to 5 other riders. Relax: Sit back, save, and enjoy the ride. WHERE AND WHEN IS uberHOP AVAILABLE? HOW MUCH WILL IT COST? Flat fare routes available weekdays from 4:30pm-7:30pm. HOW CAN I REQUEST A NEW ROUTE? Give us your suggestion here. You can also tweet your suggestion to @Uber_Canada with the hashtag #uberHOP. You’ll share larger vehicles that are otherwise available on uberXL or UberSUV. If you want to ride with a friend, make sure they request their own spot on uberHOP from their app. HAVE MORE QUESTIONS ABOUT uberHOP?